A whole bunch of linkblogging for the week! The Comic Treadmill is doing summer reruns with a look back at Flash v.2 #206-219 from 2005. Blog@Newsarama looks at a panel from Blackest Night #1 and concludes that Barry died sometime between 1991 and 1996 if “the internet” is new to him today…and then there’s his using the term “geek” to refer to himself and Clark Kent, and Grant Morrison’s comment that “When geeks get power, you get Hitler.” Um…yeah. 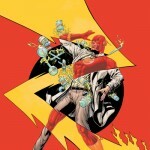 Comix 411 reviews Green Lantern #44, guest starring the Flash. Video Store Blues shows a couple of pages from the 2000 Superman and Bugs Bunny miniseries, featuring the Flash vs. the Road Runner. The Weekly Crisis wishes DC and Marvel would engage in more world-building dealing with the impact of superheroes on Earth, like the Flash Museum and Superhero Memorial Day. CBR has their own write-up of the DC Universe panel. The Source announces JSA All-Stars, a spinoff of Justice Society of America, and Newsarama interviews Matt Sturges. Comics Should Be Good has a John Byrne commission showing Doctor Doom defeating various DC heroes including Superman, Wonder Woman, Green Lantern and the Flash. CBR has The Nerdy Bird’s Flight to San Diego, including pictures of her as a Red Lantern with her custom-made plush Dex-Starr, Red Lantern Kitty of Rage! This entry was posted in Creators, Flash History, Flash News, Round-Ups and tagged Barry Allen, Blackest Night, Dan Didio, Dex-Starr, Flash Museum, Geoff Johns, John Byrne, Karl Kerschl, Linkblogging, Matt Sturges, SDCC 2009 on July 31, 2009 by Kelson. Barry and Iris in Wednesday Comics. A future Flash in The Last Days of Animal Man. Jay in Justice Society of America. And finally, a classic Barry in DC: The New Frontier. Note: The Source has a preview of the issue. It takes place 10-15 years in the future, with a possible future Flash. A new era begins for the Justice Society of America as writers Bill Willingham (Fables) and Matthew Sturges (Blue Beetle) take over the series with new artist Jesus Merino (Superman Annual) just as two new recruits make their debut with the team! Strange happenings at the JSA Mansion are weird precursors to an all-out attack on all members of the team — all but one! And what is the strange connection that new members King Chimera and All-American Kid might have with the turmoil? Writer/illustrator Darwyn Cooke’s award-winning, critically acclaimed masterpiece DC: The New Frontier is back in a new printing of the Absolute edition, featuring new story pages, detailed annotations, alternate sequences and an extensive gallery of sketches, pinups, action figure art and more! In the 1950s, Cold War paranoia outlawed the Mystery Men of the Golden Age. Stalwarts such as Batman, Superman and Wonder Woman continued to fight for truth and justice, but as the world hurtled toward an uncertain future, it would take a new breed of hero to define the American Way. DC: The New Frontier takes readers on an epic journey from the end of the Golden Age of heroes to the beginnings of the legendary Justice League of America. Darwyn Cooke’s most ambitious project yet features the stunning color art of Dave Stewart, an introduction by DC’s President and Publisher Paul Levitz, and an afterword by Cooke. This entry was posted in Out This Week and tagged New Frontier on July 29, 2009 by Kelson. After reading more about the breakdown of the Velocity ongoing series that would have launched this year, I realized it would have been something very rare: An ongoing solo book about a speedster who wasn’t the Flash. Off the top of my head, the only series I could think of was Impulse, which ran for 89 issues from 1995 through 2002…but even that was about the Flash’s cousin, who has since become Kid Flash (and was briefly the Flash). There was Top Cow’s Velocity miniseries that I’d just read, and Marvel’s Son of M miniseries starring Quicksilver, and the occasional special…but all of the long-running characters I could think of were either team members like Quicksilver (Avengers), Velocity (Cyberforce) and the Blur (Squadron Supreme), or Golden Age characters who appeared in anthologies, like DC’s Johnny Quick (More Fun Comics), Timely’s Whizzer (USA Comics), or Quality’s Quicksilver (National Comics — and he’s better known now as Max Mercury). I remarked on this on Twitter, and @cm22 pointed out one more: Marvel launched a Quicksilver series in 1997, though it only lasted 13 issues. So that’s two. Impulse, which is a Flash spin-off, and Quicksilver, which lasted only a year. Three if you count the upcoming Kid Flash series announced over the weekend, but then again it’s Kid Flash. For comparison, DC has published an ongoing Flash series from 1940–1949, 1959–1985, and 1987–2008, with only a few months off in early 2006 during Infinite Crisis. In the last 70 years, there have been only 11 in which no issue of Flash appeared. In the last 50 years, there has been only one year without a Flash book, and that was 23 years ago. If there was any question that the Flash was the most successful example of the speedster super-hero archetype, this should settle it! Note: It’s arguable that Flash Comics shouldn’t count, being an anthology series…but on the other hand, his name is in the title, his story was always the first feature, he alternated the cover spot with Hawkman, and the numbering was picked up for the 1959 Flash solo series. Besides, during most of the time Flash Comics was on the stands, DC also published All-Flash (1941–1948), which was definitely a solo Flash book! 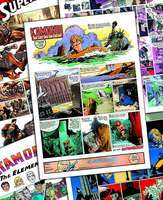 Thanks to the Grand Comic Book Database for the cover thumbnails. This entry was posted in Flash History, Other Speedsters and tagged Golden Age, Impulse, Quicksilver, Velocity on July 28, 2009 by Kelson. DC made only a few Flash announcements at Comic-Con, but they were big ones! I liveblogged both panels (though a technical glitch prevented the DCU post from actually going up as I wrote it, which really annoyed me), and there are some other remarks in those panels (and in DC Nation) that Flash fans might find interesting. In “Blackest Night: Flash,” it’s the Rogues versus the Black Lantern Rogues and Flash is caught in the middle. And Captain Cold will be facing off against Black Lantern Golden Glider. Ouch…that’s going to be one nasty fight! This entry was posted in Flash News and tagged Blackest Night, Dastardly Death of the Rogues, Geoff Johns, Kid Flash, Scott Kolins, SDCC, SDCC 2009, Sterling Gates on July 27, 2009 by Kelson. This entry was posted in Fandom, Round-Ups and tagged San Diego, SDCC, SDCC 2009, Tweets on July 26, 2009 by Kelson.